I am excited to announce that my first novel will soon be published by Loose Id. 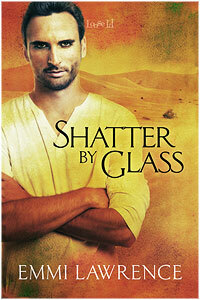 Written for their Homecoming call, Shatter By Glass is a fantasy/mystery/romance with a M/M couple. An excerpt will be coming soon. When Detective Brettoni Rhodes is assigned to investigate a murder that occurred in the desert outside his city, he doesn’t anticipate the victim to be a man straight out of his past. Nor is he at all prepared to find clues that the murderer could be an old lover he hasn’t seen for twelve years. An old lover who, once they reconnect, isn’t interested in staying an ex. With Luca Baino going from old lover to new lover all over again, Brett struggles with whether they’re on the path to something real. And if it they are, what then? Because in the desert city of DaSunder, death is the punishment for murder and Luca’s conjuring abilities have put him at the top of a very short list of suspects. In order to save the man he loves, Brett would have to go against the laws he’s sworn to uphold. But with evidence stacking up against Luca and conjured creatures appearing in the city, Brett doesn’t know if he can protect Luca… Or whether he should even try.